Create Your Cookbook in 3 Easy Steps! The 'Planning' stage— Plan out each of the following for your fundraiser. How much money do you want to raise? How many recipes? Selling Ads help pay for your books. 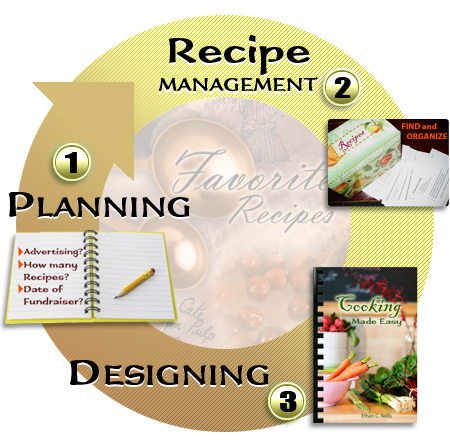 The 'Recipe Management' stage— Collect and sort your recipes, send to Fundcraft to type or type your recipes using our Short/Cut™ CD program (saves 25¢ per book). The 'Designing' stage— Complete your Fundcraft Publishing Order Form and choose your cover, dividers, recipe format, special pages, etc. and let us do the rest! Use Short/Cut™ Online (recipe typing software online!) This is the most popular cookbook publishing software. This recipe typing software is user friendly and easy to use. Once you've completed typing your recipes, you're on your way to using Fundcraft's cookbook fundraising program (one the most successful cookbook fundraising programs). So, let's start typing recipes and inform Fundcraft Publishing of your fundraising success story.